1.) Length of Credit History. 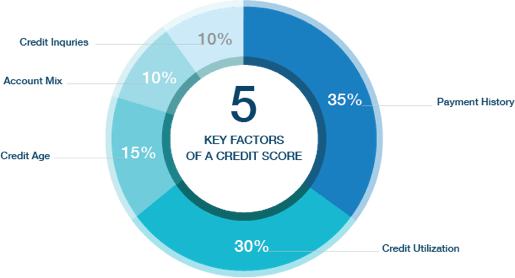 Having a lengthy credit history will be better for your FICO score. Although someone with a relatively short credit history can have an equal score as a person with 30 years of credit history, it's still important to manage the credit that is available. Thinking that it'll help improve their credit, some would consider closing cards that they've had for years, but this will add a negative effect by decreasing the average credit length by removing a card that's been on their report for years. 2.) Don't Pay Collection. A lot of people have this idea that paying their debt collection means it will help rebuild their credit automatically. Paying your debt collection signifies that you owe the collection, which negatively impacts your credit score. Best thing to do to fix this is to first call and ask the collection agency if they can remove the debt, agree on an amount to pay if they agree to remove it off their report, and then the agency will have the collection removed off your account. 3.) Be Careful: Authorized Users. It's true that being an authorized user can help build or rebuild credit, but you should not take this decision lightly. Lenders will have too much information when it comes to authorized users and lenders can be wary of these if the card is under a friend rather than a family member. Since authorized users are not legally responsible to pay the credit card bill or any debts built up, an authorized user can be harmed to those who are, as the responsible party may have a high balance and have a chance to bring your score down. Newer PostHow Many Points Does an Inquiry Take Off Your Credit Report? Older PostDo You Know What Good Debt Is?